Southshore is an eastern suburb within Christchurch, New Zealand. It is home to South New Brighton school and the local batch bar and restaurant. It is rich in wildlife and forestry. Southshore was hit hard by the 4 September 2010 Canterbury and 22 February 2011 Christchurch earthquakes. Damage was caused to houses and land. Southshore was initially put into the orange zone before the beach side was zoned green on 29 October 2011. The estuary side remains in the orange zone awaiting land announcements to decide if it is financially worth repairing and rebuilding on that land due to the extensive damage caused by the two main shakes and also the ongoing aftershocks. In August 2011, residents were informed that they could expect a land zoning decision within six weeks. Later that month, it was announced that the decision would be released in September. In mid September, the decision was delayed due to "unexpected complexity". On 12 October, Gerry Brownlee as Earthquake Recovery Minister apologised for the delay and asked for another two weeks of patience. The 29 October 2011 decision split Southshore into two zones. In November, Brooklands was zoned red, but the decision for Southshore was further delayed. In mid December, Brownlee wrote to residents, stating that a decision would be made 'prior to Christmas'. On 23 March 2012, land zoning decisions were made for the remaining areas of Linwood, Richmond and the Avon Loop within the Central City, while Brownlee wrote to the 401 Southshore home owners stating that they should have a decision during April. By the end of April, Roger Sutton as Chief Executive of the Canterbury Earthquake Recovery Authority issued an apology to residents for further delays. 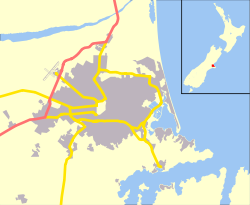 ^ Population reported for South New Brighton, which incorporates Southshore, from Quickstats about South New Brighton. Statistics New Zealand, retrieved 5 May 2012. ^ a b c d Greenhill, Marc; Anna Turner (2 May 2012). "Delays cold and callous, say angry orange-zone residents". The Press. p. 1. ^ Mann, Charley; Nicole Mathewson (23 March 2012). "New riverside red zone". The Press. Retrieved 4 May 2012.